What started out as a pisstake of 80s comics like Frank Miller’s Daredevil soon turned into a multimedia empire for creators Kevin Eastman and Peter Laird. Twenty years on, TMNT seems to suggest that the Ninja Turtles franchise is far from dead. 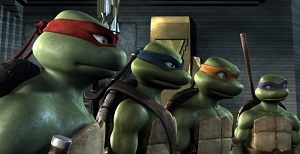 CGI animation is a rather appropriate medium for the turtles, mainly cos they look so silly to begin with. In TMNT it’s in fact the human characters that are disappointing. Their features are a little too doll-like (like the first Toy Story), and it’s a pity the animators didn’t opt for more realistic characters that would match the backgrounds. I’m sure it’s simply a case of too small a budget, but the film often relies on super-fast, disorienting stunts that fail to impress simply cos it’s hard to see what’s going on. In a time when comic movies (Batman Begins, X-Men) and kids’ movies (Shrek, The Incredibles) are opting for a more sophisticated, relevant route, TMNT is decidedly old school. It’s so similar to an episode of the TV series that it’s at times embarrassing. The bad puns, tacky exposition and forced ‘coolness’ are all there. I have memories of an episode where Shredder sliced up a pizza base with his gauntlets and threw the result at the turtles, wisecracking ‘here, have a dough-net!’. The film doesn’t really improve on that. The best part of TMNT is the focus on the internal struggles between the turtles themselves. Frustratingly, this points towards a much better film, perhaps with more of a point. As it stands, the best (and best-animated) scene occurs about three quarters of the way through the film. As soon as we move to the ‘impending apocalypse’ climax, it’s rather dull. The voice acting is a letdown too. While Sarah Michelle Gellar and Chris Klein do their best as the poorly scripted April O’Neil and Casey Jones respectively, Mako’s Splinter sounds perpetually stoned. Patrick Stewart’s Max Winters and Laurence Fishburne’s voiceover are a complete waste of funds. TMNT will probably hook the kids in the way the cartoon once did, but it offers nothing for the adults. For people my age there’s a certain rush of nostalgia to be embraced, but it’s not worth your 14 bucks. In taking a safer route the film is only a fraction of what it could have been. This entry was posted in Film Reviews and tagged Action/Adventure, Animation, Childrens by Stuart Wilson. Bookmark the permalink.